Ericson Alexander Molano (born November 20, 1979) is a Spanish christian singer, know for his song"Dios Manda Lluvia". He has a Production company, Jehova-Nisi Producciones; where he is President and General Director. He is currently touring. In 1999, he released his first album El Vive Hoy, which sold more than 100,000 copies. This album includes the hit single Dios Manda Lluvia. In 2002, he released his second album, Fue Por Ti. In 2004 saw the release of Mi Pasion, featuring the singles "Mi Pasion", "Melodia Angelical", "Siento Su Gloria", "Rendir Mi Vida", and a duet with Karina Moreno, "Es Por Ti". His album, Vuelvo a Ti, released in 2006, was well received. Recorded live in 2005 in Mexico, it features the hit, "Soy Sano". In 2007 he released a DVD featuring his Greatest Hits entitled Lo Mejor de Ericson Alexander Molano. His fourth album, No Fue En Vano, was released in July 2008. Eric Alexander Molano was born on November 20, 1979 in Pereira, Colombia, the son of Reverends Nubia and Hugo Molano. He is the oldest of 4 siblings - Sandra, Libni "Leo", Gerson and Leah V. Molano. He followed his parents on Missionary trips around the world, spreading Christianity through Music and Worship. His family moved to the United States in 1986. Eventually setting place in Long Beach, California, where they would form Ministerios Salem Internacional. Their Ministry is all around the world, which includes: the United States, Mexico, Guatemala, Venezuela, Colombia, and Peru. In 1999, Molano received his Bachelor's Degree in Electronic Engineering. Molano has always had an interest in music. On November 27, 1999 Molano recorded his first Live album, El Vive Hoy, in his local church Ministerios Salem Internacional (MSI). The album contains the hit song "Dios Manda Lluvia". The song made Molano famous within the Christian community. The album also includes the songs such as "Siempre te Alabare", "El Vive Hoy", and "Hosanna al Rey". In 2000, he founded his recording label, Jehova-Nisi Producciones. (Also referred to as JN Productions as in Spanish, JN Producciones). There are currently five other artists on this label: Erick Porta, David Beltran, Manuel Garcia Jr., Eddie Soto, and Ruth Esther. He's the President and General Director of JN Productions. On March 22, 2002, he recorded his second live album, Fue Por Ti, in Van Nuys, California. The album's first single was "Maestro Tocame", which debuted in August 2002. The song was then proceeded by "Alegria" and "Estoy Enamorado". On August 3, 2002 the album was released. Molano took a two year break. On April 17, 2004 he recorded his third live album, Mi Pasion, in Santa Ana, California. The album had two released dates; the audience present at the recording received their copy of the album in July 2004. The album, however, was released to the public in August 2004. The album contained singles like, "Mi Pasion", "Melodia Angelical", "Siento Su Gloria" and "Rendir Mi Vida". Prior to recording his live albums in the states; (Since all 3 albums were recorded live in the US), his fourth album Vuelvo A Ti was recorded live in front of an audience in Mexico. Vuelvo a Ti was recorded on August 21, 2005. The album was released on January 27, 2006. The album contains the hit songs, "Soy Sano" and "Vuelvo a Ti". In June 2007, his first DVD titled "Lo Mejor de Ericson A. Molano" was released in which he performs his greatest hits. As of right now, he's on Tour. On January 22, 2008, it was announced that Lo Mejor de Ericson A. Molano would be produced into a two disc album. On February 8, the album was released into stores everywhere. On April 23, 2008, Molano recorded his fifth album, No Fue En Vano. The album was released on July 4, 2008. Molano is married to Nancy Garcia. The two wed on July 10, 2005 at Crystal Cathedral in Garden Grove, California. Molano is left-handed. 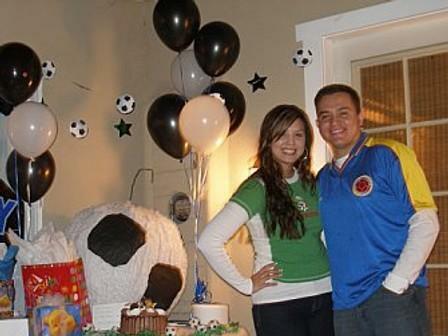 He is a Colombian soccer fan. ^ "Name search engine". Intelius People Search. ^ "Radio Emanuel Musical V 3.0". Retrieved 2007-08-18. ^ "Ministerios Salem Internacional - Pastores". MSI. Archived from the original on 2006-04-19. Retrieved 2007-08-16. ^ "Ericson Alexander Molano - Discografia - El Vive Hoy". Jehova-Nisi Producciones. Retrieved 2007-07-24. ^ "Tanto Amor. Erick Porta". Alegoria Media Inc. Retrieved 2007-09-08. ^ "David Beltran - CD. ADORARTE (En Vivo)". Pan De Vida.com. Archived from the original on 2007-09-27. Retrieved 2007-08-18. ^ "Manuel Garcia Jr. - CD. EL ES REY". Pan De Vida. Archived from the original on 2007-09-27. Retrieved 2007-09-08. ^ "Eddie Soto - CD. NUNCA IMAGINE". Archived from the original on 2007-09-27. Retrieved 2007-09-08. ^ "Ruth Esther - CD. CANTANDO LO DIRE". Pan De Vida.com. Archived from the original on 2007-08-25. Retrieved 2007-09-08. ^ "Ericson Alexander Molano". Retrieved 2007-07-24. ^ "Ericson Alexander Molano - Discografia - Fue Por Ti". Jehova-Nisi Producciones. Retrieved 2007-07-24. ^ "Ericson Alexander Molano - Discografia - Mi Pasion". Jehova-Nisi Producciones. Retrieved 2007-07-24. ^ "Jehova Nisi - Vuelvo A Ti". Jehova-Nisi Producciones. Retrieved 2007-07-24. ^ "DVD. LO MEJOR DE ERICSON - Ericson Alexander Molano". Pan De Vida. Retrieved 2007-07-06. ^ "EAM's Tour dates". Retrieved 2007-08-18. ^ "Ericson Alexander Molano - CD. Lo Mejor de Ericson Alexander Molano". Pan De Vida. Retrieved 2008-02-21. ^ JN Staff (2008-05-19). ""No Fue En Vano" Julio 2008". JN Producciones. Retrieved 2008-05-25. ^ "Jehova Nisi - Wedding Details". Jehova-Nisi Producciones. Archived from the original on 2007-07-18. Retrieved 2007-07-24. ^ Lo Mejor de Ericson Alexander Molano (DVD). Jehova-Nisi Producciones. 2007. ^ "Image of Ericson A. Molano". Retrieved 2007-08-18. ^ "An image of Ericson A. Molano". Retrieved 2007-08-06. ^ "Ericson A. Molano Colombian Soccer fan". Archived from the original on 2007-09-26. Retrieved 2007-08-06. This page was last edited on 11 March 2019, at 19:54 (UTC).